It feels as though it has rained - either a little bit or a lot - every single day since last October and whilst I gave up a long time ago stressing about the weather, it has meant that a few of my favourite locations have been put on the back-burner on account of the weather. Mel and Michael's engagement session was to take place in one of my all-time favourite spots, the Secret Pine Forest (for anyone following my stories, you would have seen this amazing location featured in Candice and Peter's engagement session last year), but due to conditions, we had to find explore new territory. As ever, life throws the most unexpected silver linings to us and I was delighted to find that Toohey Forest - just a 5 minute drive from my doorstep - offered up some of the most beautiful scenery with it's epic sandstone boulders and dramatic drops to the bush below. 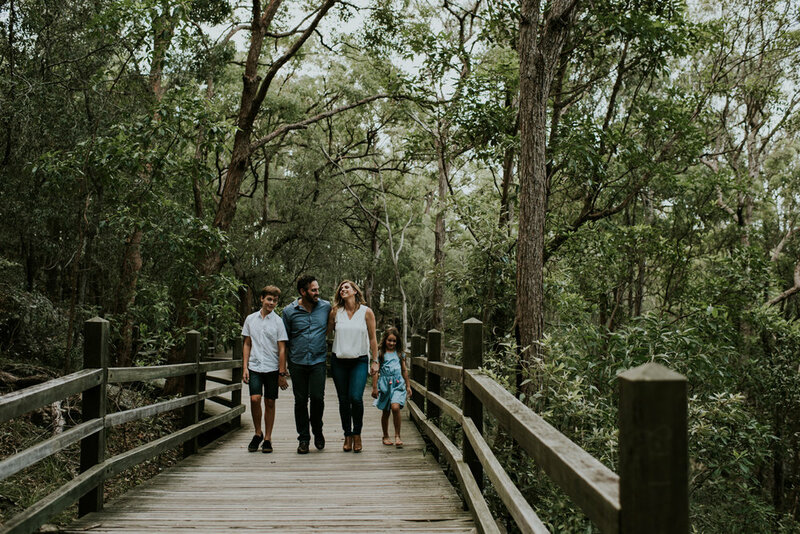 Together with their kiddos, we took time to not just find the best spots for some shots, but most importantly, there was time to just sit and take in the surrounds. The thick canopy overhead and the sound - surprisingly loud - of the breeze teasing the trees. I drove home with feelings of gratitude for all that I can discover through my work - not just beautiful hidden gems near home, but amazing clients who I get to explore such places with. It's one of my favourite things ever, to escape and explore different places with my clients. During an engagement session, you have the opportunity to capture how you are and how you love in one of the most relaxed, fun ways. Engagement sessions are included in all wedding collections and to find out more, get in touch and let's have a chat today.